This is rather 'special' stuff. Check also the more recent Spacetime webpages. The pages on the creation of holons are more important than next older text and they cover in fact the same concept. The beginning? In most cosmological models space evolves, starting from a point-like entity, around 15 billion years ago and expanding in size. Steven Hawking stated that - under Einsteins conditions of General Relativity - that a configuration of a large mass concentrated in a small volume of space (suggested by the Big Bang models) must have singularity at the beginning, and that means that the Universe had a definite beginning. Hawking said also on Black Holes that the final state of a mass contracting down to inside that Event Horizon is that of a Singularity, of a point with infinite mass concentration and curvature of space, a knot in the fabric of space and time. Interesting. The origin of the gravitation membrane is an absolute gravity field will - in our hypothesis of an unbreakable and infinite elastic membrane (check 'tensegrity of Buckminster') - implicate that (virtual) gravitons are linked to neighboring (virtual) gravitons by transversal (90° on the gravitron influencing direction) operating intermediaries. When the membrane curls it curls of course also. The most opportune gravity structure in a tensegritic membrane is the Buckyball 5-6 binding or triangle shapes which goes over in 'nano-tube'-type tubes (which are hollow) after zillions of pelastrations on the start of the Universe. Our basic departure point to create the Big Tube: ZERO = (-1) + (0) + (+1). [-30] and (+1) = [+0.81112] + [+0.181] + [+0.00788], etc. 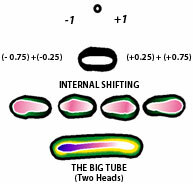 We call (-1) and (+1) a tube (T1) which has outside a very flexible layer and internal opposite energy fields. The tube has an Outside zone (Oz) and an Inside zone (Iz). The total value of the tube is ZERO. Outside the tube the value is still ZERO. The multi-dimensional Universe consists of a giant basic (fielded) tube.This act as the Prior-Geometry. This Big Tube sub-divides itself by dimensional pelastrations and spacial actions in trillions of more complex sub-tubes. So a number of sub-zones are created by self-pelastrations, pelastrations, coiling, rotation, torque, knotting, tunneling, spiraling, ... provoking new dimensions by subsequential layering extra (dimensional) membrane skins or by changing internal conditions in the tube-zones involved, but de-creates also sub-tubes in opposite ways. Since all membrane-zones are part of the same T1 membrane any movement in one of the tube-zones will influence someway all other zones. We call this process: "Tunity'. The basic tube can be originated from a spherical source (seen as part of the tube). Compare our tubes with the strings of the string theory, but hollow and with an internal energy transportation. (e.g. new steps in nano-technology). The outside of the tube is a infinite flexible membrane (mB). During the 'fast or slow (!) inflation or expansion' period the density variations between the two shifting energies (-1) and (+1) in the tube create whipping (snake-like) movements and expansion in length. Some locations have 'relative pressute locks' (twists). By some of these movements the 'head' of the tube pelastrates another location of the tube (T1). The head of the tube pushes away the original membranes of T1 (mBa-wand and mBb-wand) and carries them with him like a second (thinner) skin. This second skin contains also parts of the fluctuating internal fields of T1. The new part of the tube is now double layered (T2). This way a new dimension is created in T2 in which two different - interacting - layers are influencing each other. The center of T2 is still T1, but his skin is also T1. Still each layer has it's own (adapted) conditions. T2 (with an extra double skin) is now continuing his way of whipping/snaking and his head pelastrates again the tube T1 or T2. When T2 pelastrates T2 two new dimensions are added, but if T2 pelastrate T1 only one layer is added as a third (outer) skin ... and so on. In both situations T1 is still the center. Sub-Tubes inside a Tube Zone. A remark: Some people like Buckminster (him again) start(ed) in their cosmological view from specific balanced shapes, like a Duo-Tetrahedron in a vector equilibrium net. Our tubes can start on the vortex (center of the side, on the vertex - corners - the field is repulsive), going outside and/or inside, and come to identical pelastration actions. Pelastration is then more 'angle' bounded. This is here however not a point of discussion.